Recently there have been two studies examining how the genus Morchella, aka Morels, should be split into species. One study "Taxonomic revision of true morels in Canada and the United States" by Kuo, et al. from the journal Mycologia looks at just North American species, while the other study "Les Morilles: Une Nouvelle Approach Mondiale du Genre Morchella" by Phillipe Clowez in the journal Bulletin de la Societe Mycologique de France looks at species worldwide (I didn't read this article, it's hard to get, and in French, but I read a nice summary of the Clowez article in FUNGI Magazine entitled "Morels - the Name Game" by Britt A. Bunyard. The past nomenclature of morels has been a bit inconsistent and confusing, and since the two studies were done independently, the names still don't match up entirely. I've always just called them all good to eat and not worried about it, but after reading about the two studies I thought I would try to figure out, based on descriptions of ranges, which species are in MN, and to try and familarize myself with morel taxonomy. This post just concerns the morels that are typically called "Black Morels" and the "Half-Free Morel". These are the generally earlier, smaller, and darker colored morels in MN. Past names have included M. elata, M. conica, and M. angusticeps. The first two names are those of European species applied to similar looking mushrooms found in N. America. Both Kuo et al. 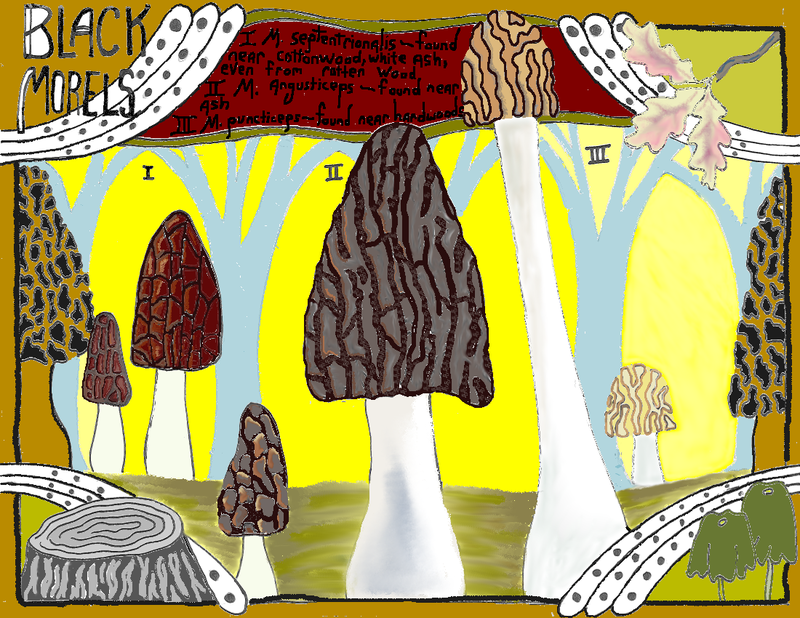 and Clowez use the name M. angusticeps for black morels in the eastern US. Kuo et al. also describes a very similar, more northern, and smaller species, M. septentrionalis. It was identified as a separate species based on DNA evidence. I included these morels in this post because they are related to the morels commonly known as "black morels" (all the species in this post are in the Morchella elata, or black morel clade). It is usually listed as M. semilibera. Again, this is the name of similar European species. The eastern US species of Half-free Morel is M. puncticeps. Generally these names won't be found in guide books, though you will probably find the generic names Black and Half-free. They are still the same mushroom, just new names and the recognition of more distinct species than before. So I'm doing a little research and field work of my own to see what species I can actually find.